I have to say I fell extremely short on the majority of my Four Simple Goals in February. Pretty much the only one that got any attention was the last one Play More Games Together. We did a lot of game playing recently. We'd play together & we played with others, so I'd say that goal was accomplished & I'd like to keep it up. Spending family time together is something I need to focus on this year. Organized a planner - I went away from blog planning probably about a year ago. When I started my new job a lot of things changed & the blog was one of them. I am glad to say I'm sort of back on track here & now have a blog and a life planner. Getting organized is an over arching goal this year to focus on. I found I'd started to forget everyday simple things so I thought a planner might be a good option. 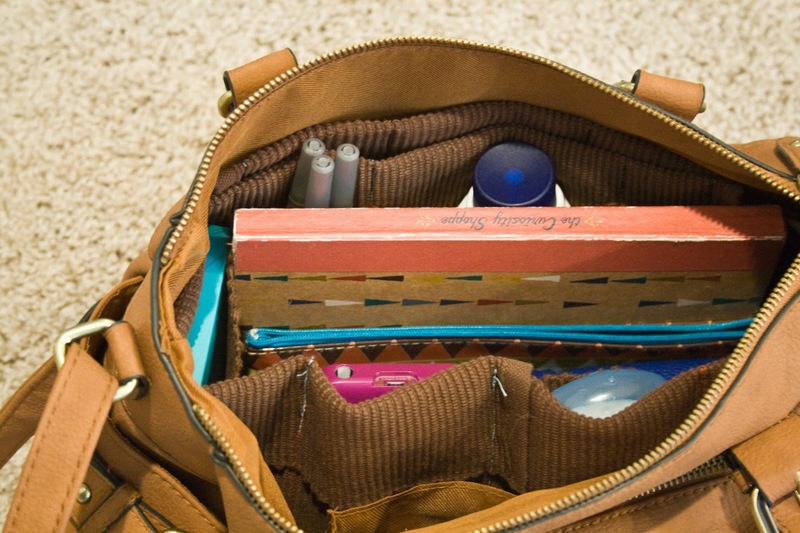 DIY Purse Organizer - If you're looking to organize your purse, let me point you towards my DIY here. I used two placemats to make an organizer for my purse & I've found I can fit much more in there & I don't have a crazy amount of stuff stuffed everywhere. I've found I use a lot of stuff more regularly & am not fumbling around for my phone or chap stick. Began an Organized House Journey - If you missed it, I posted an affordable organization haul on my YouTube channel here & I am excited to say that even though I didn't get to the closet organization on my list I did organized a few other things. I got to a kitchen cabinet, our coffee table, my nail polish collection, & under the bathroom sinks under control. I don't remember if I mentioned this in my first Four Simple Goals post but for this project I simply want to be moving forward. I set goals so I have something to do - if I don't meet them I still want to do something. Sometimes I feel like life has a way of telling you what is important & I tend to go with that. If cleaning out the closet doesn't feel right then organizing my purse, planner, kitchen, & bathroom sinks must have been the right thing to organize. Having ideas for one thing then translating them into another thing isn't necessarily failing at the original goal - at least not for me. Right now in my life I don't want to pressure myself into doing things, like adding to the Zazzle shop. If it's not right, it's just not right. Anyway, hope you're moving forward this year & I can't believe we're in the third month of the year already! What did you accomplish this past month? How do your goals & ideas change over time? Are you as indecisive as me?